allows for the antenna to be positioned well off the ground and in good line of sight to the rest of the network. A multicore cable connects through the bottom of the enclosure and is taken to a source of power and the probes closer to ground level. something to your own requirements. feature allows centralised configuration and supervision of the network. of iCommunicator is scheduled for release and this will allow connection through an Android smartphone or tablet. legacy product using 151 MHZ, this will be used for new installations. We expect to release a 920 MHZ version shortly after which will be compatible with older 920 MHZ XStream installations. NRI Electronics released a new version of its Datatenna Link last year. This was a new packaging with full tranceiver functions on the 433 MHZ license free radio band. The intention was always to expand on that new design, leverage the smaller, elegant packaging and create a full range of communication products which were initially compatible with the older EIT products and which would provide a solid development base for advanced designs. The first of these products, NRIE Probe Link is now close to release. There has been a great deal of design effort in creating a product which is future proof. 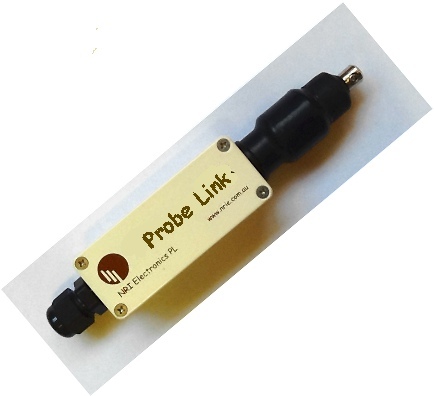 At the completion of current field trials the Probe Link will be available in both 433 and 151 MHZ versions. Building on this platform, we will be releasing a 900 MHZ spread spectrum design and also a WiFi version. New hardware demanded new software and the iCommunicator PC based software for configuring the new links is now available for download. It works well with the older EIT controllers and is a replacement for the older Universal software.